A new monthly magazine, the Reporter, debuted on the Stetson University campus this week, replacing the student newspaper and ushering in “a dramatic change” to student media. The Stetson Reporter, the oldest collegiate newspaper in Florida, established in 1887, needed a change to keep it relevant to students today, said its Editor-in-Chief Jason Cruz. Students, faculty and staff were surveyed last spring about Stetson student media and a task force decided “a dramatic change was needed,” Cruz wrote in a letter to readers in this month’s issue of the new magazine. 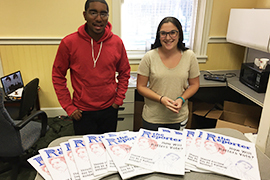 Two Editors-in-Chief: Jason Cruz and Gabby Cassidy talk about the new Reporter monthly magazine in Hatter Network’s student media office inside Elizabeth Hall. The Reporter joined with Touchstone, Stetson’s annual literary publication, to print 500 copies of the glossy monthly magazine. Touchstone also will continue to publish each spring with poetry, short stories and photography, said Gabby Cassidy, also Editor-in-Chief of the new magazine and a sophomore majoring in English. The two publications merged with other student media under a new umbrella, called Hatter Network, which includes the student internet radio station, WHAT, and a new video production group, WHNN Hatter News Network, which posts its segments on Hatter Network’s Facebook page. The Reporter also posts its stories on the same Facebook page. Hatter Network staff hosted a launch celebration for the Reporter on Thursday night, Nov. 17, at 8:30 in front of Hulley Tower with free food and drinks. It coincided with the weekly Uncouth Hour, the open mic night affiliated with Touchstone. “The idea around the country right now is to merge student media into one organization, and Stetson has been a little behind on that,” said Nick Saffan, Hatter Network Director and a senior majoring in digital arts. Nick Saffan is Director of Hatter Network, the umbrella for Stetson student media. The change in the Reporter’s format allows the staff of 14 to spend more time reporting and writing about campus news, sports and opinions. “We’re going for quality instead of quantity,” Saffan added. Hatter Network hired an outside firm to design and run its website, www.HatterNetwork.com. The website should go live before Christmas break, Saffan said. Under the merger, the various student media will share resources, talent and expenses. For example, they now have a central graphic design team and share editing duties. Hatter Network added video production this year, WHNN Hatter News Network, which was the brainchild of senior Samantha Zarek, its executive producer, and a communication and media studies major. Samantha Zarek is executive producer of the new video production group, WHNN Hatter News Network. Zarek, who interns with WESH-TV Channel 2, said about 30 to 40 students have joined the video team as associate producers, social media managers, camera operators and on-air talent for news segments and weather forecasts. Initially, WHNN rented cameras and tri-pods, and also used smartphones to record videos. But it has since purchased camera equipment and a drone with video capability. A studio set will be built in Hatter Network’s office in Elizabeth Hall, room 110 – and eventually move into the renovated Carlton Union Building, the students said. Tony Pizzo is Station Manager of Stetson’s student internet radio station, WHAT. For the student radio station, Station Manager Tony Pizzo said he hopes to increase student programming and produce more podcasts as he continues to revive the station and raise awareness about it. He hopes to soon have only Stetson-produced content on the radio station. All of the changes stem from the work of the Student Media Task Force, created in the fall of 2015, to “integrate and enhance” Stetson’s student media. Its members researched other colleges, conducted the surveys across campus and made recommendations for improvements. Andy Dehnart, Stetson Visiting Assistant Professor of Journalism, served as co-chair of the task force and praised the student journalists for making quick progress in uniting under one umbrella and redesigning the Reporter. “I was really impressed, especially since just a few months ago the students were sitting around a table and brainstorming about how they could come together and produce something collectively,” Dehnart said. — Readers of the Reporter magazine are encouraged to email hatternetwork@gmail.com with any feedback or questions.